Chordion, by Olympia Noise Co.
Chordion was a bit of a surprise to me. I had heard good things, but until it was in my hands inspiring me to explore its many offerings, I hadn’t really taken notice. What a pleasant surprise indeed. 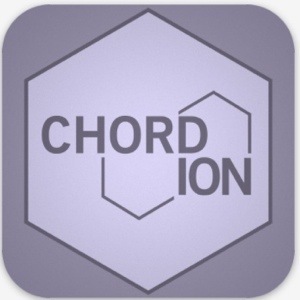 Chordion employs several functions to provide a fulfilling musical experience. The scales and keys selections are numerous, allowing the user to make simple or exotic selections for any sort of style. You play chords (Hex Keys) with one hand while strumming or hitting individual notes with the other. All in perfect tune. Each of the icons on screen represent a visual queue as to which options and parameters are to be selected. It’s a nifty, clean interface for quick navigation. There were times at first while learning the interface where I lost track of where some things were but I got used to it pretty fast, so I don’t consider it a flaw. 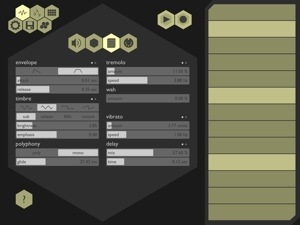 Chordion has a decent and simple built in synth, but with more controllable parameters than most of this breed. Such controllable tidbits like Timbre, Envelope, Polyphony, Delay, Vibrato, and so on. That’s a nice option allowing a lot more user sound control, but really where Chordion shines is when it controls your favorite synth. Virtual Midi control is set up with ease. A nice no nonsense design makes it all quick to set up, and get right to it. In no time I was snapping out melodies and chords simultaneously feeling very good about the experience. 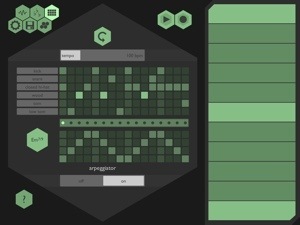 In addition to the synth, Chordion sports a handy Arpeggiator, and 4 different drum machine styles to expand its functionality. One could write complete songs using only Chordion. With Audiobus support, sending all the audio to record in your favorite iDAW is a cinch. You could also use its built in record feature to save performances and then upload to SoundCloud, Dropbox, or iTunes File Share. AudioCopy is noticeably absent. I know many users who either don’t have Audiobus or just prefer ACP would appreciate that to be added in a future update. 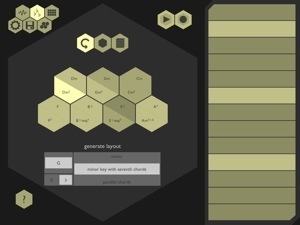 Chordion is rich with tools and options to design and play with your own unique style. With the many scales available and more being added this becomes a potent instrument. Easily customize your own scales and layout. The interface is very responsive with no detectable latency or any stability issues. It’s comfortable and fun. Not to mention deep enough to make Chordion accessible to any musicians level. I couldn’t really find anything to complain about. 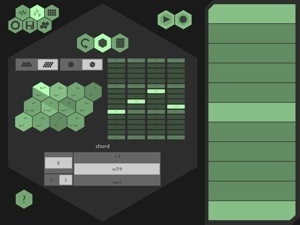 This is a remarkable, full featured Midi controller/instrument. Sure, there are a lot of Midi/instruments available on iOS. 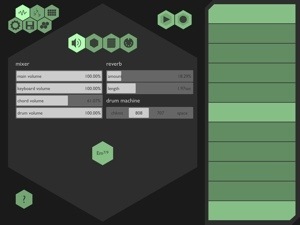 Chordion separates itself by a wide margin with including so many options to tweak (there’s that word again) the sounds, play chords, leads, arpeggios, accompanied by an included drum machine. All pooled together in a marvelous U.I. This is the most comfortable and content I have felt with an app of this breed so far. My experiences with the Virtual Midi control while also running this through Audiobus were so pleasant and issue free, that I just can’t help but recommend this fantastic app with a big smile. I really really love Chordion! Together with Sampletank it’s an amazing combo! Worldclass! Chordion rocks. I bought it the second it came out. The developer was helpful and integrated midi features that others and I had recommended. It runs a bit slow on an ipad 1, but still very fun and inspiring.